Whether you're remodeling a single room or building an entire house, the lighting fixtures you choose (and where you put them) are important. Our home experts are sharing their best tips and ideas regarding the placement of lights -- room by room -- and the types of lights that work best in various situations. See our top picks for lighting options both inside and outside your home, and how to install lighting yourself. If it involves home lighting, you'll find it here! Think that exterior home renovations are expensive? They can be — if you’re not careful. But I’ve got some awesome DIY home exterior design ideas to share with you that WON’T break the bank! Pick a weekend and get busy with these exterior home remodel projects: a mailbox makeover, create a natural pathway, spruce up your front door, and other simple ideas that cost next to nothing. 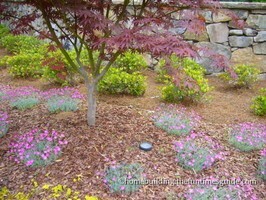 When you think of curb appeal do, you think of a perfectly manicured front yard? I used to. Here are great curb appeal ideas for those of us without a yard! 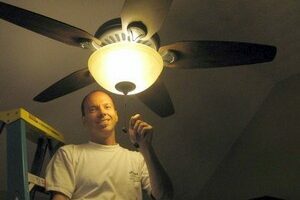 Install a ceiling fan yourself to save money. It’s a good DIY project that can be tackled with patience and a bit of fortitude. I have a few helpful tips to help you through and a guide on how to buy a ceiling fan. Fishing wires through your walls for sconces can be frustrating, to say the least. FlatWire is an invention that gives DIYer’s the opportunity for professional retrofitting results. Is it worth the added expense, though? Looking for a unique exterior landscape lighting solution? LED lighting has come a long way. These are very bright, colorful and require zero maintenance. Very cool stuff! Properly disposing of spent fluorescent light bulbs, CFL’s and HID bulbs is your responsibility. Learn where to recycle your old bulbs with these helpful links. Paul Ryan of the DIY Network suggests using flexible track lighting to meet the high standards in today’s kitchen lighting requirements and for ease of installation. 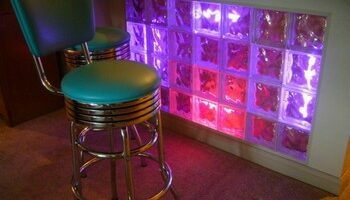 Here’s a neon-lighted glass block wall that is well-suited to a really fun 50’s-60’s era retro rec room. What a great idea! 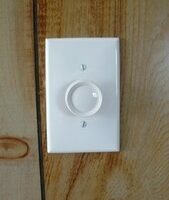 A wall sconce is a great way to add a custom look to your home. Here are a few ideas that custom homebuilders and/or homeowners have installed. Landscape lighting can truly set the tone for a neighborhood as well as your home. The Retreat at Kennesaw Mountain in Marietta, GA is a fantastic example of the way it’s done right. Please enter…I’ve left the light on for you.